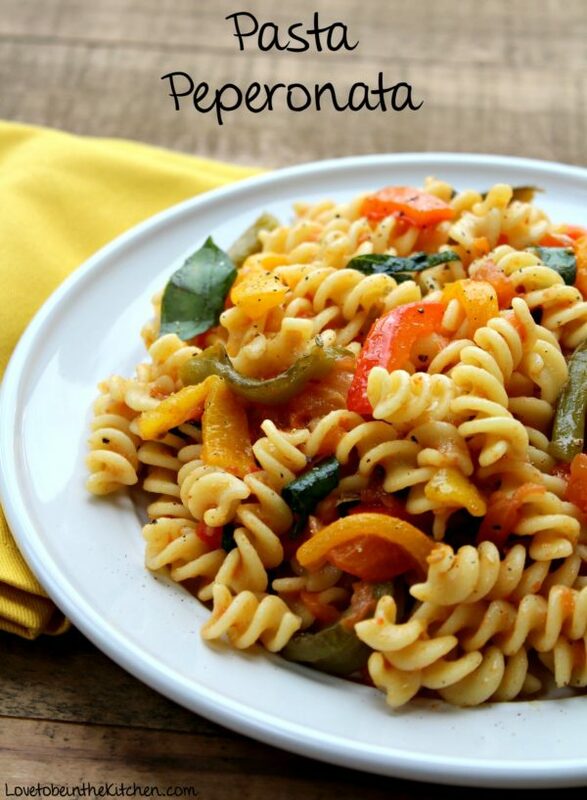 Pasta Peperonata- A fresh pasta sauce made with only 5 ingredients! Bell peppers, plum tomatoes, garlic, olive oil and basil. The bell peppers and tomatoes are roasted to bring out their full flavor. 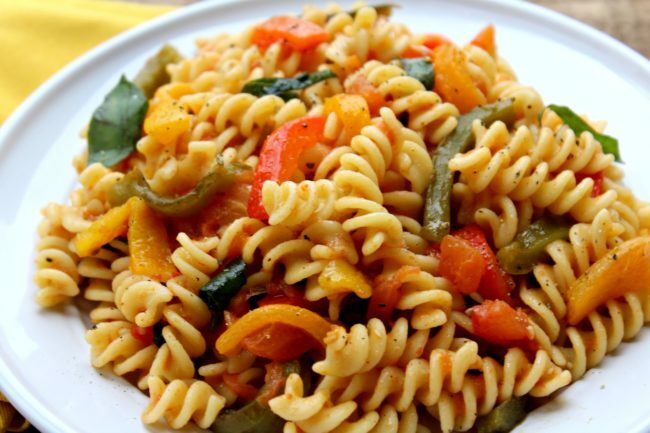 This light and flavorful sauce is tossed with fusilli for a fast and delicious dish. I love trying new recipes and new ways to prepare ingredients so when I found this recipe in my recent issue of the Food Network magazine I was so excited to try it! In my research to learn more about what peperonata is I found out it’s typically a dish of stewed peppers, onions and tomatoes and is a Southern Italian dish. We love all things Italian in this house so we were big fans of this recipe! Bell peppers are the star of this dish! To make the fresh pasta sauce you roast the peppers and plum tomatoes in the oven. In this recipe you broil it for 15 minutes. By doing that you need to keep a close eye on them and turn them often. But if you’d rather you can roast them at 400 degrees for 20 minutes, turn them then roast another 20 minutes. I found this post about roasting peppers from Tori Avey very helpful if you aren’t familiar with roasting peppers. The sliced peppers and chopped tomatoes are the delicious base for the sauce but garlic, olive oil and basil are added and are the perfect flavorful additions! 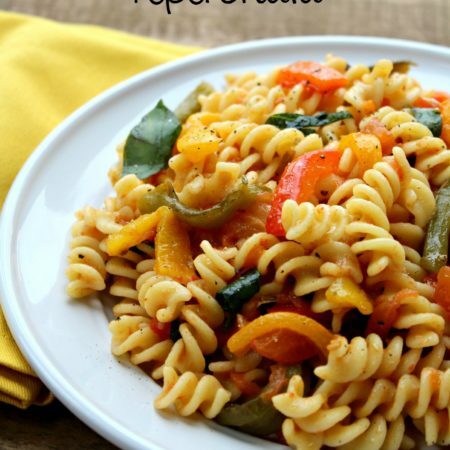 You toss in fusilli pasta and sprinkle with salt and pepper and drizzle a little olive oil. When I tasted it the first word that came to my mind was fresh. It’s so delicious! We enjoyed this for dinner but today I had it for lunch cold and it was so good! This recipe is amazing because it can either be served warm or cold. If you serve this as a pasta salad you could add a little splash of vinegar for a kick. I was thinking it would make an awesome meal prep recipe at the beginning of the week. It would taste amazing with grilled chicken as well. This recipe is a winner and I think you’ll love it! Line a baking sheet with foil and place the bell peppers on their sides along with the tomatoes. Broil for about 15 minutes. Turning every few minutes as needed until charred. Let cool. *Take off the skin and remove seeds from the peppers and cut into strips; peel and chop the tomatoes. Cook the sliced garlic cloves in the olive oil in a pot over medium heat until beginning to brown, 3 minutes. Add the roasted peppers, tomatoes and any collected juiced, 1 teaspoon kosher salt and a few grinds of black pepper. Bring to a simmer, cover and cook, stirring occasionally, until saucy, 15 minutes. Toss with the cooked fusilli pasta, adding up to ½ cup pasta-cooking water to loosen the sauce. Take off the heat, stir in the basil and season with salt and pepper. 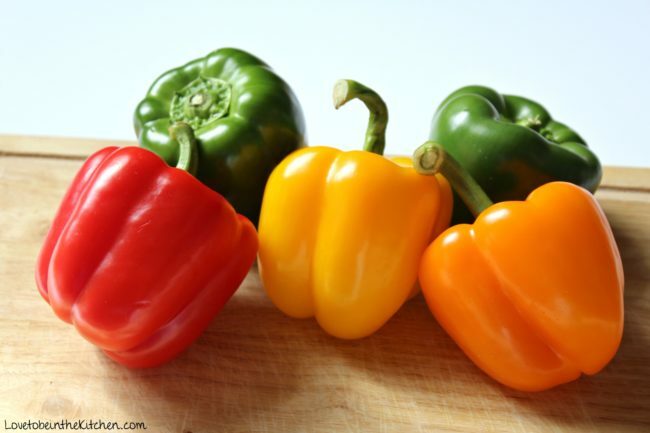 *If needed to make it easier to remove the charred part of the peppers, place peppers on a cutting board and place a large bowl over them and wait 15 minutes.